You may well remember Quill friends how very wet and rainy it was this past Sunday. 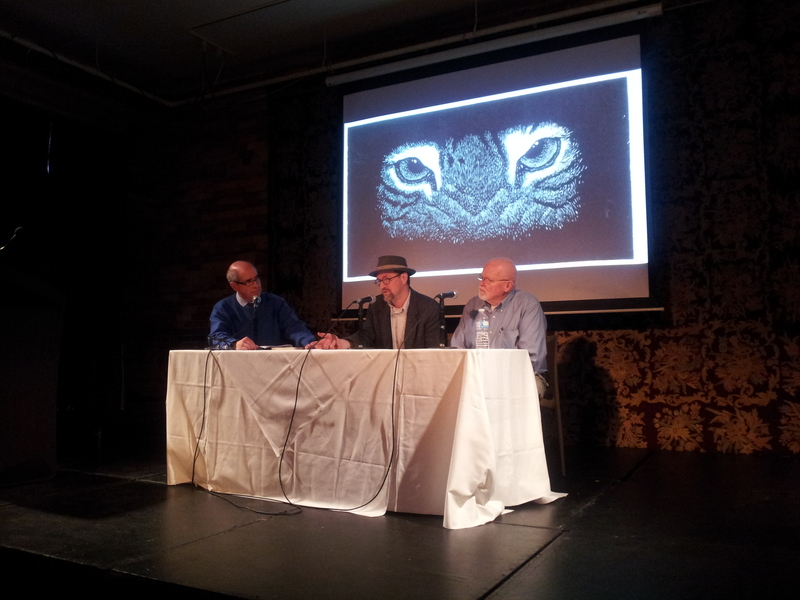 Well, it was in this inclement weather that I made my way along Queen street to the Gladstone Hotel for the Quill’s most recent event: New York, New York at the Gladstone. We had spent a great deal of time preparing for this event, coordinating with This is Not a Reading Series (TINARS), getting our artists to agree on a date (you may have realized by now that it is exceeding difficult to get Jon Evans to stay in one place …), and getting the word out to all our friends. This Sunday I am happy to say that all our work paid off! Thank you so much to all of you that came out to join us. For all of you that were scared away by the rain, I’m here now to give you a first hand, behind-the-scenes account of that special day. You can also check out the video highlights, courtesy of TINARS videographer Meredith Wright, here. The day began for me as I was running up the steps of the Gladstone Hotel, four minutes past noon. I had been told to arrive early to help set up, but the streetcar was diverted at Shaw Street, and I had to walk several city blocks in the rain (fortunately sheltered by a leopard-print umbrella). As I made my way west on Queen Street, I walked past boutiques and galleries and couples having brunch in cute Parkdale coffee shops. I arrived only four minutes late and found Tim, Elke, and Jim Westergard in the Gladstone ballroom, orchestrating table arrangements and pulling books out of boxes. Having never been before, I discover that the Gladstone Hotel is an exquisite old building. Built in 1889 by G.M. Miller, the building’s exterior is instantly recognizable for the dramatic Romanesque arches over its windows and porches. The hotel fell into disrepair over the last century (Jon Evans would give us a first hand account of its darker years later over dinner), but in 2000 it changed ownership and a restoration project began. Today the hotel has been beautifully restored, maintaining its classic feel. The restored pillars in the Melody Bar are the last of their kind and the Victorian hand-operated elevator is one of only a few in Toronto. In the ballroom I could see touches of Victorian elegance in the beautiful hardwood floors, exposed brick walls, and plaster mouldings above the tall windows that lined the west wall. It was nice to see such a beautiful building restored to its original glamour. … As we unpacked boxes we could hear friends laughing and clinking glasses as the enjoyed brunch in the cafe just across the hall. Beasts of New York on display at the Gladstone Hotel. This was the first time I met Jim Westergard, and I can happily say that he is a lovely man. Elke, Jim, and I talked about the weather as we worked, and Jim confessed that he enjoyed winter because it meant he could work in his studio without interruption, watching birds come and go outside his window. Calling Red Deer home, Jim probably spends more months snowed in than not, and it is pleasant to imagine spending the winter in a studio, watching the snow fall outside. By two o’clock, the rest of the artists arrived: Jon Evans, who I had met a few weeks ago, and George A. Walker, who I had the pleasure of meeting for the first time. 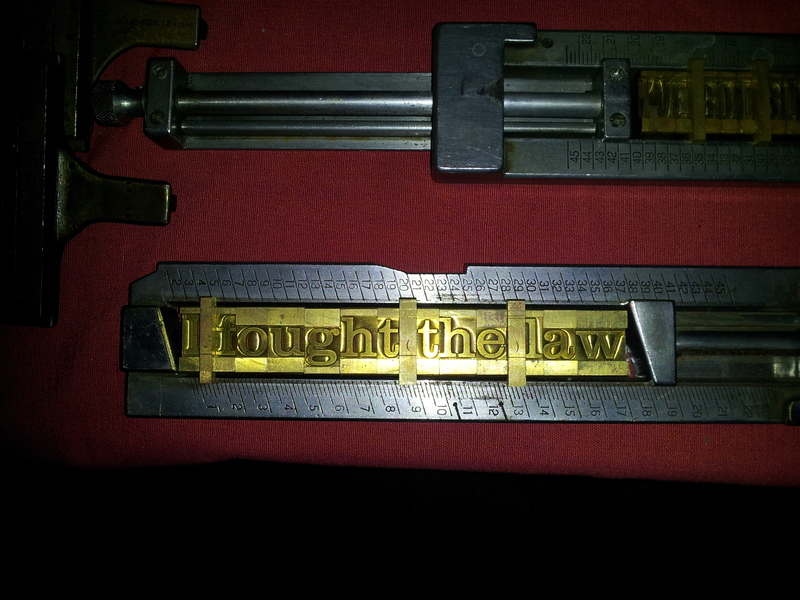 We were also joined by Ken Wrigglesworth of Don Black Linecasting, who brought a Victorian parlour press and an extensive letterpress display. Once TINARS organizer, Marc Glassman, arrived, the audience began to take their seats and we were ready to go. 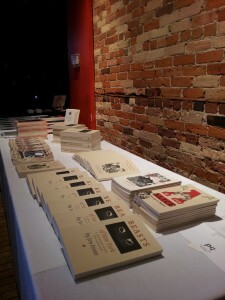 Don Black Linecasting provided an extensive letterpress display for the event. We began with a screening of a film adaptation of George A. Walker’s Book of Hours, which you may see here. George’s ninety-nine engravings were projected onto a screen, set to an original score by Neil Exall. George had specifically controlled for time in the film, so that as tensions rose images flashed faster and faster before the audience’s eyes. But throughout the film, the images of the digital clock remained eerily static, reflecting the indifference of time to the impending disaster. As George pointed out, the film was an adaptation of his book—not merely a projection of its images. The manipulation of sound and time provided another layer to the story, and definitely augmented the audience’s experience of the book. 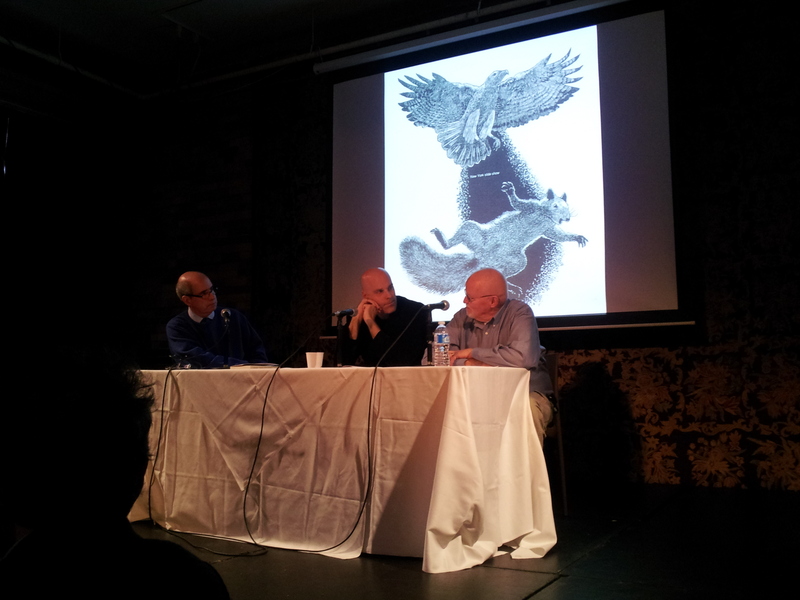 Next Jon Evans and Jim Westergard were joined by moderator Tom Smart to discuss the creation of Beasts of New York. Tom Smart picked up on the discrepancy in the novel between Jon’s fantastic story and Jim’s realistic images, pointing out that Jim’s engravings provide ‘the fabulous surrealism of Jon’s novel with a frightening layer of truthfulness’. I had felt this myself as I read the book, experiencing an odd uneasiness as I made my way through the story. Jim explained that this had been a deliberate choice. He felt it was important to create realistic images since Jon had created realistic characters. Anything else would have bordered on caricature or cartoon, which Jim said he ‘certainly recognized Jon didn’t intend’. Jim's engravings provide 'the fabulous surrealism of Jon’s novel with a frightening layer of truthfulness’. Following the panel discussion, Jon read selected passages from his book with the assistance of an interactive map of New York City. As Jon had explained earlier to Tom Smart, his writing is always linked to place. He told stories of travelling to specific hostels in far-off locations merely to ‘get the details right’. Through Jon’s presentation the incredible, mythical landscape of New York City came to life. The afternoon concluded with George and Jim as Tom Smart led them in a discussion of their differing engraving styles. As can be seen plainly, George takes an expressionistic approach while Jim prefers realism. When asked, Jim joked ‘I calls ‘em like I sees ‘em’. Though I was to learn later at dinner that compared to the schools of wood engraving in Britain, Jim’s work is rather interpretive as well. As can be seen plainly, George takes an expressionistic approach while Jim prefers realism. When asked, Jim joked ‘I calls ‘em like I sees ‘em’. 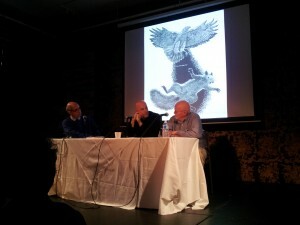 Most rewarding out of the conversation was the artists’ justification of their craft. ‘Why wood engraving?’ Tom Smart asked. And it’s certainly a valid question. There are faster, more efficient ways of creating images today. Here both artists agreed that it was the process that attracted them to the art form. George commended emerging technologies, but firmly defended his choice. He asked, when new technology supplants the old, is something lost? As the sun was beginning to set on the Gladstone Hotel, it seemed a fitting question. One might also ask the saviours of the Gladstone, why restoration instead of demolition? Or the Inksters, why hand-printed, hand-sewn books? Standing in the foyer or the Gladstone Hotel or thumbing through the thick pages of a book produced by PQL I think it is clear. 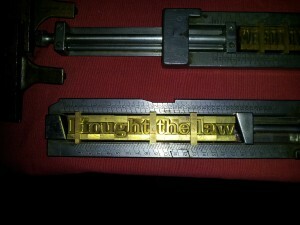 Without the maintenance of older forms, be it architecture or the book arts, something valuable would indeed be lost. 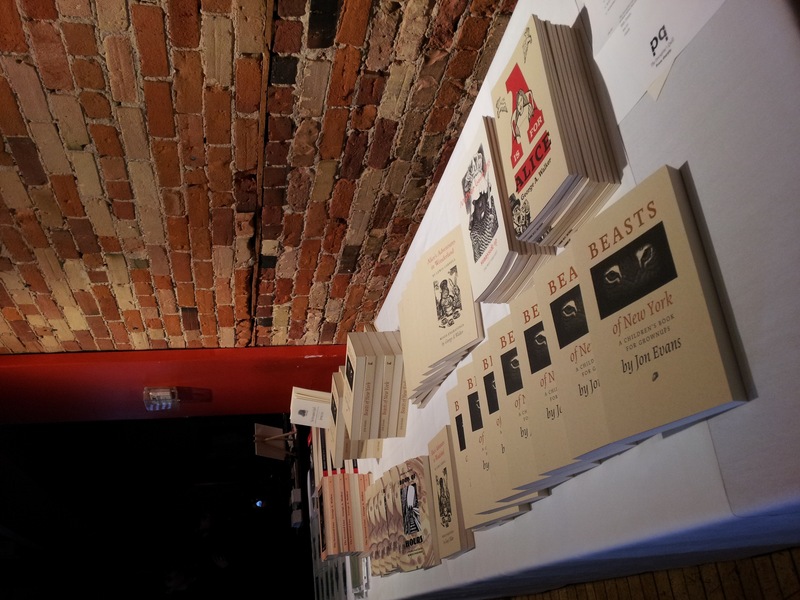 So thank you to TINARS, LPG, and the Gladstone Hotel for making this event possible. Thank you to Jim, Jon, and George for their hard work. And finally thank you to all of you for coming out and spending some time with us on a rainy Sunday! 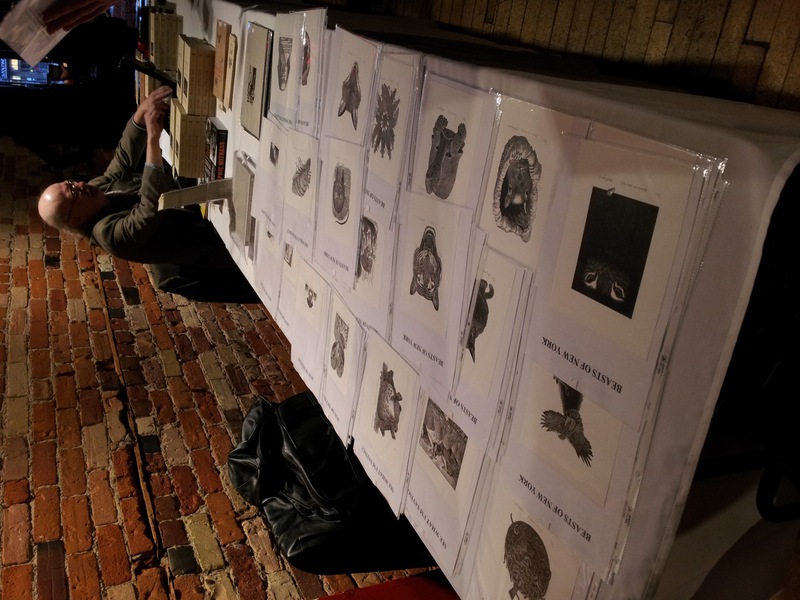 We’re hoping to see you again this Saturday at the OCADU Book Arts Fair! 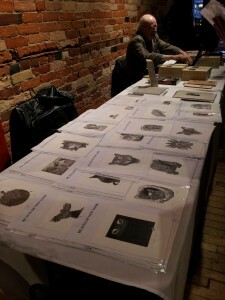 Jim Westergard's prints were on sale at the event.